We’re a little bit obsessed with peplums right now. Not only were they peppered throughout dozen’s of designer’s Spring 2012 collections, they’re also feminine, chic, and the best way to cover up the bloat of an overindulgent brunch (woops). 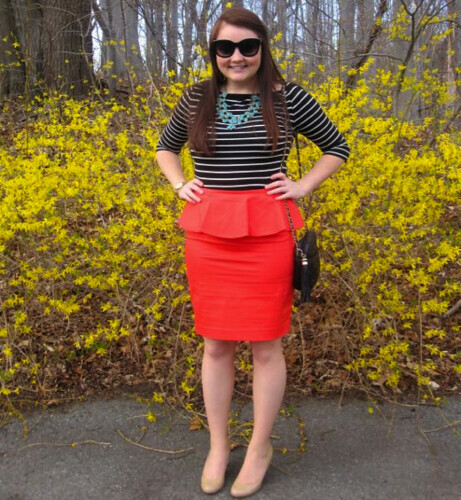 When we spotted LaurenConrad.com member Casey Lynn‘s peplum skirt and striped shirt, we had an instant style crush and knew she needed to be crowned the Chic of the Week! Congrats Casey Lynn! We love your classic, feminine look and the turquoise necklace is a killer touch. To check out all of her outfit details (including where Casey Lynn picked up all of these enviable pieces) check out her profile! We’re curious, are you crushing on peplums this spring? Let us know below. Happy weekend–may it be filled with good style and lots of laughter!